You don’t have to be a child left in a car, or an elderly person with no air conditioning on a hot day, or an athlete training under triple digit temperatures with an obsessed coach, to die from heat stroke. In fact, just about anyone can suffer the ill effects of heat exposure. In August 2003, a heat wave in Europe claimed more than 50,000 lives. In the United States, hundreds to thousands die of heat-related deaths every year, with the vast majority of heat-related injuries unreported. In fact, in the U.S. more people die from extreme heat than from hurricanes, lightning, tornadoes, floods, and earthquakes combined, yes, combined. Although, the elderly, the chronically ill, and young children are most susceptible to heat-related deaths, studies show that more athletes die from heat strokes than from heart attacks. Famous among these athletes, is Minnesota Vikings player Korey Stringer who, in 2001, collapsed during a morning pre-season practice and died later that day from heat stroke. Exertional heat stroke is a serious issue for all athletes, but especially for youth athletes who need their parents and coaches to beware of extreme heat conditions, offer many water breaks, hold practices during the cooler parts of the day, and limit the length of practices. Young children left in cars, however, are the most vulnerable among us, unable to get themselves out of their car seats and cars. Since 1998, there have been 625 heat stroke deaths of children left in cars. More than half of those deaths were of children under the age of two. Last year, in 2013, there were 44 heat stroke deaths of minors, and halfway into this year we have 19. More than half of all children who died in a car from heat stroke were simply forgotten there by their caregiver. Of the 606 children who died of heat stroke in cars from 1998 to 2013, 91 of them died in Texas, 66 died in Florida, and 40 died in California, only four states had zero of these fatalities. Unfortunately, only 20 states have laws specifically addressing leaving a child unattended in a car. Clearly more can be done on the legal front, but information and education is the most important immediate solution to the problem. Parents and caregivers need to know and understand that a child’s body temperature can rise three to five times faster than an adult’s because their heat regulatory system is not well-developed. They also need to understand that even a car on a cloudy day with outdoor temperatures below 70 degrees can cause heat stroke deaths. A child can die in a car from heat stroke in less than 15 minutes. The temperature in a car could easily reach 200 degrees and cracking the windows open will not help. In fact, leaving the windows rolled down in a car on a hot day will not help, either. The internal car temperature can increase 20 degrees in 10 minutes and 50 degrees in one hour. A heat stroke death is minutes away. There are three major heat-related illnesses: heat cramps, heat exhaustion, and heat stroke. Heat stroke is the most severe of these, considered a major medical emergency. Heat strokes occur when the body’s internal body temperature reaches 104 degrees, causing shock, brain damage, failure of internal organs, and, ultimately, death. Symptoms associated with heat stroke include hot skin, nausea, vomiting, headache, fatigue, confusion, agitation, lethargy, stupor, seizures, and coma. Take it seriously. 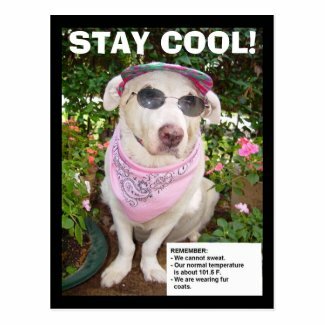 If you suspect someone is a victim of heat stroke, move them to a cool place to rest. Immediately call 911, they will need to be treated by a physician. As you wait for medical help, remove excess clothing spray or pour cold water over them, fan their skin. Place ice bags on their armpits and groin areas. Give them something cold to drink, if they are alert and able to drink. The most important thing to do, before taking them to a hospital, is to cool them down immediately. The best thing to do is to get in the habit of never leaving your children or pets in a car alone and always checking the back seats before you lock up your car. When you travel with your children or pets, put a visual reminder in the front passenger seat or put something you need – like your purse or briefcase – next to your child’s car seat. One final thought, if you ever see a child unattended in a car, call 911. If the child appears to be unresponsive or in danger of heat stroke, do what you must to save a life. It is easier to apologize for trying to save someone’s life who did not need it, than for not doing anything for someone who did. USA Football – HEAT PREPAREDNESS & HYDRATION: Protect your athletes from heat illnesses. Reduce risk, recognize and manage heat illnesses. The Weather Channel – Dog Care: Your Car Is An Oven!